In this tutorial I want to show how to add pictures, a gallery and a featured Image. I will show you how and what to fill in before adding a picture. So you have to upload images by clicking on the Upload Files button and then on the Select Files button, that will bring you to the files which are saved on your computer. We are now in my saved pictures files on my computer. 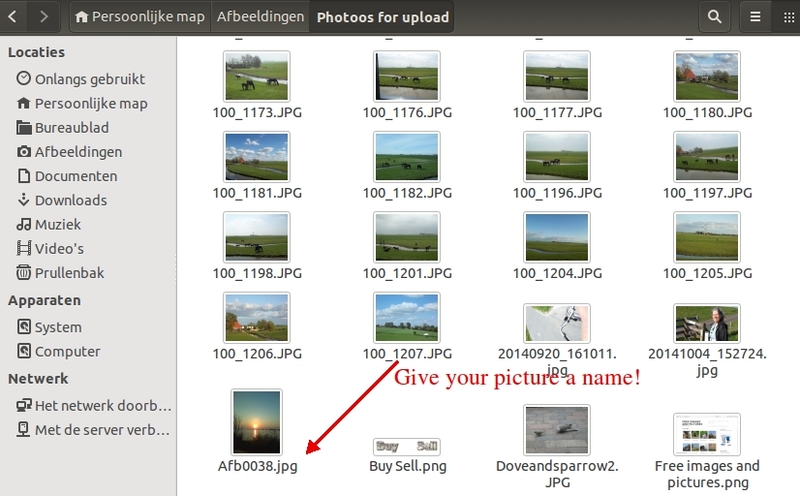 At first...give your picture a name before uploading, so it will enter on your website with an own url name. I will call this picture "Sunset"
Okay, so there's Title, Caption, Alt Text, and Description to fill out. I know Caption is what shows up under an image on website accompanying picture. I've heard that Alt Text is for people who are blind. However, what is the Description for? I mean, who will see it? Or will it be invisible to people but visible only for search engines? Alt text is for Google image search too, when people search with keywords for images. So you say "give your picture a name before uploading." That is, do you HAVE TO give the image file the words you want it to have BEFORE you upload it to WordPress Dashboard, and does that mean changing the name AFTER uploading to WordPress won't work? Take a look here How accessible is your website for visually impaired people? Straightforward and right on point,. Thanks for the great training. Suppose I don't have any files to upload. Then what? Then find some to save :) go to a spot like pixabay or something similar where you can download royalty free pics and you're all set. Hi Loes thank you or the guidance in this tutorial on the use of images. This is excellent. More that I asked for but great stuff for me to keep going back to. Thank you. Thanks for this,i add this to my bookmarks too. This is something I have to bookmark, too. Thanks, Loes. Great, Thanks it is time to have a go. Amazing!Amazing!Amazing!why I give up on my last online biz was due to maneuvering images.its such s pain in **s!Loes why I didn't know you earlier?or I should say why I didn't join WA 1year ago?Sigh. Thank you Loes! This tutorial helps me a lot, I just applied it in my page, the one you've suggested to change. All the best Loes! Does it matter if it's from my iPhone from my pictures? No. Just make sure they're your pictures. Wonderful tutorial! Thank you Loes! thanks loes was wondering where to get pics. very helpful. Thanks again, but Ihave a bigger problem, I just realized i messed up the spelling in my domain name do I have to trash my site. how can streach the picture to be more width (let say from one side of the page to the other) but to keep the height? I need to change it before i guess, right? Irfanview is a free download that allows you to re-size any image how you want. Just untick the keep aspect ratio to do what you ask. Thank you Loes for this useful refresher. Very nice, Loes. I haven't used the Gallery feature yet. Guess I'd better look at how it might help me organize better because my gallery is getting larger. Thanks. Very clearly explained Loes, thank you for this useful tutorial. Nice tutorial Loes, very helpful. Great tutorial, thanks Loes, takes time to get to know all you need to do to make a good post, photos are so important, as some people are visuals, it is important to get good photos according to your site!. My theme supports static but I think I have to change the theme. I went into WordPress but it was alien language to me. Hahaha... neither do we... I think I'm having the same issue he is... and it may be the theme... can themes be changed or are there parts of it you cant? I also named each picture. I googled it Loes after you told me it is offline. I got it. I can upload to all my pages but not get any pictures to upload to my front page. The page you see when my link is clicked. What am I missing here? I tried to access your website to see your frontpage, but it is not available, do you have a blog or a static frontpage. Not that I know of. I will check and remove it if I do. Good lesson Loes, thank you for the complete tutorial on adding pictures into Wordpress posts/pages, very helpful for me. God bless. great lesson loes... thank you..